CLAY AS YOU GO. 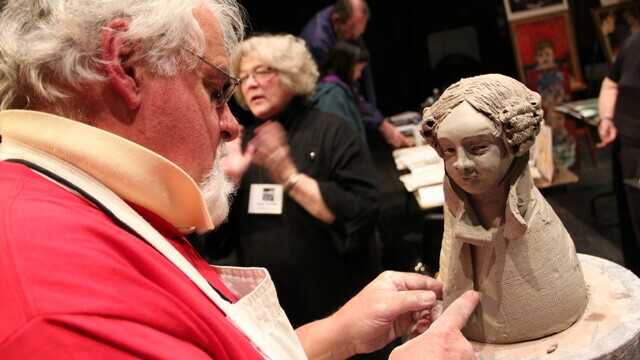 Fall Creek-based sculptor Mel Sundby shapes clay during the 2012 liveART event at the Eau Claire Regional Arts Center. If you’ve never experienced it, the easiest way to describe the Eau Claire Regional Arts Center’s liveART event is an on-stage art tour or art crawl – without the touring or crawling parts. 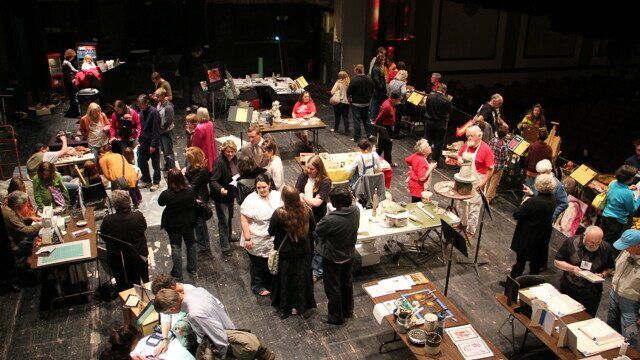 Now in its fifth incarnation (it was last held two years ago), liveART will feature eight local visual artists – including painters, potters, and sculptors – who will temporarily relocate their studios to the State Theatre stage April 10. Patrons will be able to gain insight into the artistic process by mingling among the artists, watching them work, asking them questions, and maybe even taking home a work of art. As the event’s name implies, the artistic process will be happening live for all to see. In addition to the visual artists, the stage will include live jazz and two dance groups (including the Torch Sisters, whose aerial performance will make use of the stage rigging). “We really just want to show the Eau Claire area what we’ve got as far as an arts community,” explains Rose Dolan-Neill, ECRAC’s director of visual arts. “We want to provide that outreach for kids and families to participate in the arts and see how approachable it can be.” To that end, attendees at this year’s liveART will be able to create their own art in addition to watching professionals at work. The opportunity to draw a live model will be offered in the theater lobby, with instruction (if you want it), drawing supplies, and a model (of course) provided. The lobby will also host a free paint workshop (complete with easels, paints, and instruction), while henna tattoos and ECRAC’s ARTmobile – which provides art activities for youngsters – will be situated in the entryway between the lobby and the theater. Beverages will be available on stage and in the lobby, with proceeds going toward the creation of the Laurie Bieze Gallery in the planned Confluence arts center. On stage, visual artists will include such well-known locals as painters Terry Meyer and Jody Balow; watercolor artist Patricia Mayhew-Hamm; fiber sculptor Paula Gorski; printmaker Jessie Pautsch; sculptor Mel Sundby; potter Ted Semling; ad fiber artist Alice Weickelt. Shaping clay into a human form in front of an audience gives members of the public a stake in the artistic process, Sundby says. “People come around and they look at the stuff and they say, ‘Who is it?’ and I’ll say, ‘You tell me,’ ” he says. “That blows them away because they feel that they’re responsible in some way.” And being granted that kind of stake in the creation of a work of art is something that can only be achieved live.